Compliant health copywriting should conform throughout all marketing channels. This includes all aspects of marketing online and offline. What that means is not always clear. The FDA and the FTC provide extensive guidelines. Nevertheless, according to a 2016 study by Manatt Phelps & Phillips LLP, more than 2/3 of websites are not FTC compliant. Is yours? 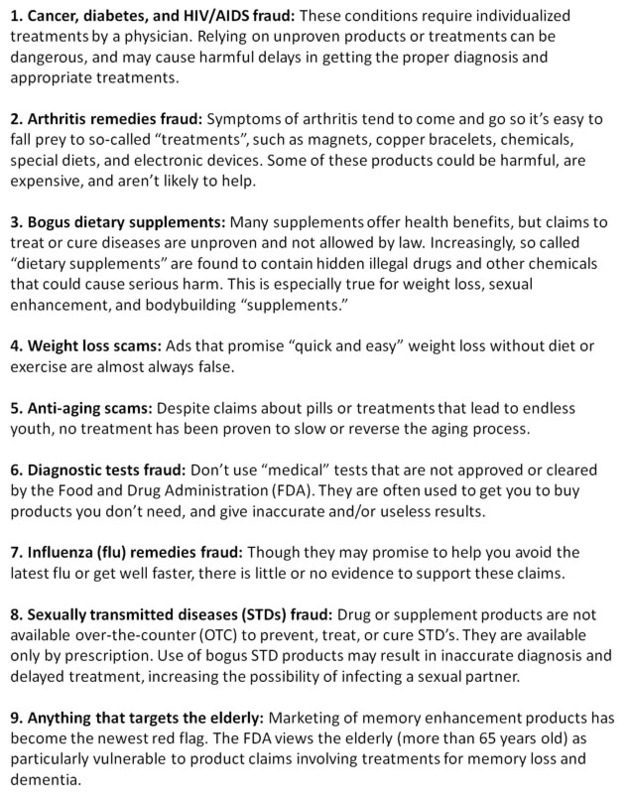 In 2011 the FDA published a list of the top scams in health and wellness marketing. Every item attracts guilt by association for all natural health businesses that sell products in these areas. The main reasons behind this list are two-fold: 1) marketing in these areas is often a scam; and, 2) natural products that address these health issues compete with (and take money from) pharmaceutical companies. Your marketing can do nothing about reason #2. Nevertheless, you must make sure that you toe the regulatory line to avoid a dreaded FTC or FDA notification letter. Consider FDA list below as a heads up. This list originally included just the first eight items. More recently the baby boomer market has generated official concern for item #9. Take a look at these Red Flags here. If you’re a natural product supplier, manufacturer, distributor, or retailer whose products involve any of these areas, they’re looking hard at you. To be sure, excellent natural products are known for all of these health issues. Plenty of research in the medical literature says so. The negative bias by the FDA shows through in that list in spite of all the good natural approaches that are supported by strong research. The main point is that you have to be especially sharp and on your toes if you are marketing natural products that address these areas. Even if your product outperforms FDA drugs, you will be challenged to use such comparisons in your marketing materials. It doesn’t matter, for example, that there are no good FDA-approved weight loss drugs or Alzheimer’s treatments. Before you ever put a word to paper, make sure that your marketing department and any copywriters that you have hired know the basics about compliance. Start with the following five principles from 2015 on the the FTC blog. (Complete explanations of these principles are available at the original article cited below). Claims about serious medical conditions call for serious science. Testimonials may trigger a triple-barrel substantiation requirement. 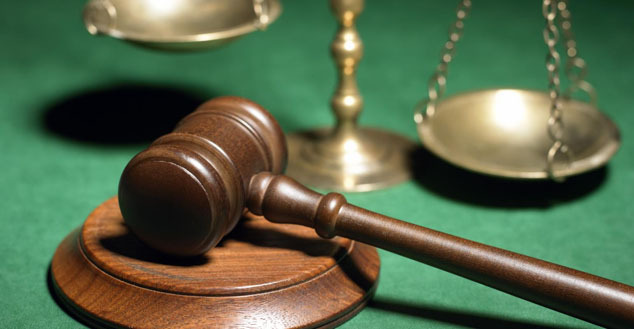 Savvy marketers heed comments in FTC-published warning letters online. “Bandwagon” products can be dangerous vehicles since they often have little scientific support. Number one, your online presence must be totally compliant, from top to bottom, on every page. Fortunately, you can get good traffic and sales in spite of FDA restrictions. You will have to pass over some great keyword phrases. Nevertheless, you can still get good search volume while staying compliant. Pages optimized for health or disease claims must be at least 2 clicks away from reference to any product related to them. This is standard practice. It fits within DSHEA requirements. However, it is not coded into law. An effective approach to using the 2-click rule is to have product websites separate from informational or educational websites. Educationally-focused websites can be optimized for certain health claims about specific ingredients without mentioning branded products. Research references can be cited on such sites without limits. To be sure, content marketing is a convoluted way to market natural health and wellness. It also makes analytics more difficult, since there is no direct connection to a sales funnel. Many e-commerce sites endeavor to capture leads with an optin offer. Most of them do not do it well. Success depends on how enticing the offer is. Once you have a lead, you can use follow-up email marketing to introduce your products. This strategy allows you to apply analytics. Indeed, keeping track of traffic, download rates, link clicks, etc., keeps your sales funnel full, converts visitors into customers, and creates brand loyalty for repeat purchases. This is still tricky business, though. Unless you are careful, the FDA might accuse you of using disease claims as part of your overall marketing message. Compliant health copywriting is subject to the FDA’s interpretation of what disease claims are. It can change at any time. For example, not long ago high cholesterol wasn’t considered a disease. Then the FDA claimed ownership of the new disease, “hypercholesterolemia.” Now it is off limits for discussion in marketing copy that refers to a product brand. This is exactly where an experienced health copywriter is worth his or her weight in gold. Knowing what is allowed and not allowed, keeping up with regulatory changes, and still producing actionable marketing copy all comprise the core of any successful marketing strategy for natural health and wellness. None of this is difficult if you know what you are doing. Indeed, that is where we at Dr. Dennis Clark & Associates shine. Go ahead, CONTACT US RIGHT NOW to see how we can help you power up your marketing materials with actionable, results-driven compliant copy. 2016. Study Finds Low Compliance for Native Advertising. 2011. Health Fraud Scams …are Everywhere. Get the Facts.